ES/Remote software and Axcess/400 Remote Access Unit from NLynx Systems provide true 32-bit emulation for remote Windows 95 or Windows NT users who need connectivity to IBM Midrange Systems. Now, small office/home office users, telecommuters, and travelers can easily connect to an IBM AS/400 or System/36 from any remote location for simultaneous 5250 terminal and printer emulation. Asynchronous dial-up support. The ES/Remote software provides quick and easy asynchronous access via Twinax to your IBM midrange systems. Users can connect to display and printer sessions simultaneously from home, hotel, or customer sites, supporting modem speeds up to 19.2Kbps. Easy to install and configure. Installation and configuration are intuitive using the ES/Remote setup program included in the software. The program provides easy-to-follow step-by-step instructions that will get your system up and running in minutes for more productive uses. Online help facility. Built-in product support provides simple and fast solutions to common product questions. Dual CPU design increases speed. The powerful dual CPU architecture of the Axcess/400 incorporates one asynchronous processor and one Twinax port processor. This dual CPU design yields maximum output, even with all asynch ports in use! File transfers and screen prints are faster, while throughput is maximized for increased productivity. 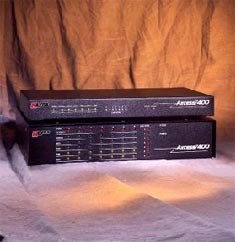 Remote asynch dial-up to 19.2Kbps. Quickly perform all PC Support and host applications from any remote site with higher-speed data transmission that reduces phone line charges. This speed is supported by ES/Remote software, and the connection is simplethe Axcess/400 can be connected to your ASCII devices through DOS LANs, statistical multiplexers, CBX, PBX, or asynch modems. Supports the same proven features as all Emerald Series solutions, such as 132-column color display and 3812 printing. Hotspots identify host menu and function keysthey can be assigned colors for easy access. Keystroke memory and playback allow storage of up to 2,048 key-strokes in up to 24 keyboard macros. ETU file transfer support allows direct file transfer between the PC and System/36�, Advanced Series/36�, or AS/400�. Axcess/400 Remote Access Unit, available in different port configurations with one Twinax port connection. Two RS-232 to 9-pin AT-style serial cables and F/F gender changer (allowing for easy terminal or PC setup, whatever your physical RS-232 connection style). Warranty: NLynx limited one-year warranty on hardware and 90 days on software. Call NLynx for additional ordering information. In the U.S., technical support is available between 7:30 a.m. and 7:00 p.m. (CST), Monday through Friday, toll-free on 1-888-659-6967. For Asia/Pacific, Australia, and Latin America, call (512) 301-8180. For Europe, Africa, and the Middle East, call +44 161 928 7014. ETU�: File transfer utility that resides on the S/3X or AS/400 and provides menu-driven options for transfer and translation of data between the PC and host.